The holidays are here. And if you need to get into the Christmas spirit, I suggest you buy, beg or bargain to get a ticket to see Buddy the Elf and his friends in the musical Elf which is playing at the Arkansas Rep through January 4. This frothy, fun, friendly show has but one aim – to entertain. And how it does succeed. With a smart, witty, heart-filled book by Tony winners Thomas Meehan (Annie, The Producers, Hairspray) and Bob Martin (The Drowsy Chaperone, TV’s “Slings & Arrows”), the story works on several different levels. (Incidentally, Meehan takes a swipe at his other Christmas-NYC set musical Annie with a joke, while Martin seems to be aping The Drowsy Chaperone by having the story open with a man in a chair). The score by Tony nominees Chad Beguelin and Matthew Sklar (The Wedding Singer) ranges from toe-tapping to heartstring-pulling. Elf is, of course, based upon the eponymously named film. Disclaimer – I’ve not seen the movie. I do not get Will Ferrell’s appeal, so steer clear of most movies starring him. But love of the movie is not necessary to enjoy the stage musical. The book, score, cast and production values take the audience on a wild sleigh ride of holiday fun regardless of familiarity with the source material. As Buddy the Elf, Ethan Paulini is a chief reason for the show’s appeal. He is rarely off stage, and somehow manages to keep a high level of energy throughout. His ebullient Buddy is both naïve and knowing. Whether singing, dancing or acting, he never overplays the part or goes for cheap laughs. Through his performance, one believes that he really does charm his way into everyone’s hearts regardless of their age or gender. As the object of Buddy’s affection, it is a joy to watch Alyssa Gorgone’s Jovie transform from guarded to glowing. She deftly handled her songs and dances. Gorgone and Paulini have a nice chemistry together as the court each other. David Hess moves from blustery to boasting in his portrayal of Buddy’s dad. Anna Lise Jensen is a delight as his long-suffering wife whose struggle to find her own place mirror’s Buddy’s quest. As Buddy’s younger half-brother Price Clark is a joy to watch. He is neither precocious nor cloying. Instead, he is a believable kid who is concerned about his parents and is thrilled to have a new brother. Tessa Faye stops the show as Deb the secretary as she comically aids Buddy and leads the office in a rousing production number. Kyron Turner and Tanner Wilson make the most of their scenes as harried employees hoping for a holiday miracle. J. B. Adams bookends the show as an avuncular, folksy Santa Claus. From beleaguered New Yorkers to bored Macy’s elves to depressed Santas, the ensemble fill the stage with delightful characters. Hannah Eakin, Allison Stearns, Jason Samuel, Jimmy Kieffer, Anthony Bryant, Chris McNiff, Jack Doyle, Samantha Harrington, Tatiana H. Green, Marisa Kirby, Eric Mann, Kennedy Sample and Mary Katelin Ward have enough vigor, vim and verve to make the cast seem much larger than it actually is. The elves are played by the younger members of the cast. These kids are having fun – and why not? They get to spend the show in two of the most magical settings imaginable: The North Pole and New York City at Christmas. They very ably perform their production numbers and create memorable characters without stealing focus from Buddy and Santa. Addison Dowdy, Gunner Gardner, Reagan Hodson, Anna Beth Jeane, Ethan Marbaise, Max McCurdy, Danny Phillips, Grace Pitts, Corbin Pitts, Niall Prochazka, Marisol Sela, and Madison Stolzer were welcome additions to the production. Most of these performers are seasoned veterans of the Rep’s Summer Musical Theatre Intensive. They show that their talent works in the wintertime too. Nicole Capri directed Elf with a light, comic touch. She neither glosses over nor smothers the audience with the heart in the show, she trusted her performers and the story to bring it out. She keeps the show moving at a brisk pace while allowing for enough quiet moments that it does not seem frantic. Marisa Kirby’s creative, crowd-pleasing choreography put the actors through their paces. Together Capri and Kirby fashioned production numbers which allowed each performer to stand out as an individual character while still part of a seamless ensemble. Elf’s magical world was ably served by Shelly Hall’s colorful costumes, Dan Kimble’s lighting, Allan Branson’s sound and Lynda J. Kwallek’s props. One of the joys of the show is undoubtedly the songs. Credit for that goes largely to Mark Binns, the show’s musical director. He leads the orchestra as they play the peppy, tuneful score. He also deserves credit for helping the actors maximize their sounds as they perform the songs while executing Kirby’s inventive choreography. 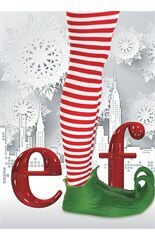 Though based on a 2000s movie, Elf is really a throwback to 1950s and 1960s workplace musicals. There are the buffoonly bullying boss, the comic-relief secretary, the dancing office boys and office girls, the disconnected wife and kids, and, of course, the outsider hero who saves the day and wins the heart of the leading lady. The show also offers dancing Santas, prancing elves, and a travelogue’s worth of New York City settings. Elf doesn’t ask the audience to think too hard or to get wrapped up in cloying sentimentality. It merely wants to entertain as it allows the audience an escape from daily strife. No matter your holiday of choice at this time of the year, the Rep is giving audiences a present with Elf! The Arkansas Repertory Theatre’s production of the holiday musical Elf opens tonight for a run through January 4. Adapted by Thomas Meehan (The Producers) and Bob Martin (The Drowsy Chaperone) from the popular 2003 film starring Will Ferrell, with a score by Tony®-nominated songwriting team of Matthew Sklar and Chad Beguelin (The Wedding Singer), Elf turns one of Hollywood’s most beloved holiday hits into a hilarious and heartwarming musical that towers above the rest. When a young orphan who mistakenly crawls into Santa’s bag of gifts is raised in the North Pole, unaware that he is actually a human, his enormous size and poor toy-making abilities eventually cause him to face the truth. As he embarks on a journey to New York City to find his birth father and discover his true identity, Buddy strives to win over his new family and help New York remember the true meaning of Christmas. The cast is led by Rep veteran Ethan Paulini as Buddy. Others in the cast include J. B. Adams, Price Clark, Jack Doyle, Tessa Faye, Alyssa Gorgone, David Hess, Anna Lise Jensen, Jason Samuel, Anthony D. Bryant, Hannah Eakin, Samantha L. Harrington, Jimmy Kieffer, Marisa Kirby, Eric Mann, Chris McNiff, Allison Stearns, Kyron Turner, Tanner Ray Wilson, Tatiana H. Green, Kennedy Sample and Mary Katelin Ward. The elves are played by Addison Rae Dowdy, Gunner Gardner, Reagan Hodson, Anna Beth Jeane, Ethan Marbaise, Max McCurdy, Danny Phillips, Corbin Pitts, Grace Pitts, Niall Prochazka, Marisol Sela and Madison Stolzer. The creative team includes director Nicole Capri, music director Mark Binns, choreographer Marisa Kirby, costume designer Shelly Hall, sound designer Allan Branson, prop designer Lynda J. Kwallek and lighting designer Dan Kimble. A regional theatre premiere at Arkansas Rep, Memphis is a new musical with music and lyrics by David Bryan of Bon Jovi fame and lyrics and book by Joe DiPietro loosely based on Memphis disc jockey Dewey Phillips, one of the first white DJs to play black music in the 1950s. Appearing on Broadway from October 19, 2009 to August 5, 2012, Memphis garnered eight 2010 Tony Award nominations, and won four 2010 Tony Awards, including Best Book of a Musical, Best Original Score, Best Orchestrations and Best Musical. 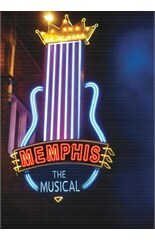 Set in the 1950s in the musically-rich Tennessee city, Memphis tells the story of a local DJ with a passion for R&B music and an up-and-coming singer that he meets one fateful night on Beale Street. As their careers rise, their relationship is challenged by personal ambition and the pressures and prejudice of the outside world. From the first notes of its opening number “Underground” right up to a rousing finale called “Steal Your Rock ‘n’ Roll,” Memphis delivers one energetic song after the next, with electrifying singing and dancing along the way. The production is directed and choreographed by Lynne Kurdziel-Formato. Other members of the creative team include Mark Binns (music director), Mike Nichols (scenic designer), Rafael Colon Castanera and Mark Nagle (costume designers), Bill Webb (lighting designer), Allan Branson (sound designer), Lynda J. Kwallek (properties designer) and Rob Pickens (wig designer). The cast is led by Brent DiRoma and Jasmin Richardson. Others in the cast include Ann-Ngaire Martin, Bill Newhall, Tony Perry, Arthur L. Ross and Gregory L. Williams. The cast also includes Katie Emerson, Ryan Farnsworth, Maris Kirby, Daniel McDonald, J. Nycole Ralph, Courtney Blackmun, Michele May Clark, Tatiana H. Green, DeCarl Jones, Chris McNiff, Gregory Omar Osborne, Shuan Repetto, James Roberts, Kyron Turner and Laura Leigh Turner. Performances are at 7pm on Wednesday, Thursday and Sunday evenings, 8pm on Friday and Saturday evenings and matinees on Sunday at 2pm. The production runs through Sunday, September 28.